Halfway through a reading competition for children with disabilities, two Portland Public Schools with The Shadow Project rank in the top 10% nationally. For many students, this is their first reading contest. Most schools hold reading competitions to engage children in literacy. But for students with learning challenges – who might be reading two or three years below their peers – these traditional contests are often out of reach. Learning Ally audiobooks, however, which The Shadow Project provides to schools, are specially designed for children who learn differently. Children listen to a book while following highlighted text on a computer or tablet, controlling the settings to suit their unique learning style. Every year, the nonprofit Learning Ally hosts the Great Reading Games, a contest to see which schools can read the most audiobooks in seven weeks. Using assistive technology, Shadow students read more than 30,000 audiobook pages in January! Portland schools participating in the 2018 Great Reading Games include Bridger, Woodmere, Rosa Parks, Abernethy, James John, and Sitton schools, with Bridger and Woodmere currently in the top 100 for most audiobook pages completed, and James John not far behind. Shadow also provides to these schools reading coaches, through which children set goals to increase reading at home. Kim Giarelli, learning center teacher at Rosa Parks, says tracking students reading for contests is a real motivator. 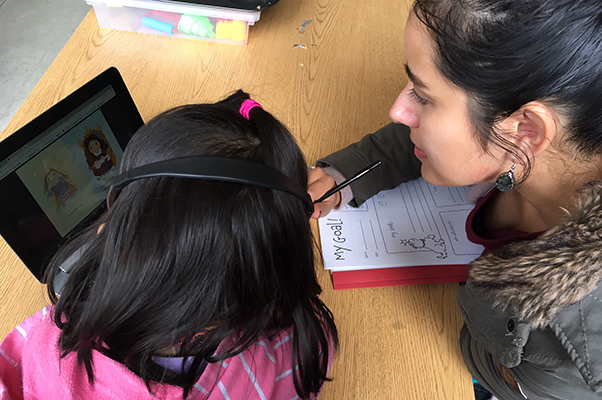 Beth Brod, Woodmere learning center teacher, added that her students are more confident readers, thanks to audiobooks, and that reading time is increasing, and consequently reading scores are going up. Taj, 12, doesn’t like to read because he finds it slow-moving “with all those letters moving around.” But he will try to read when Ms. Brod asks him to read on the audiobooks.